It was the Friday before the 4th of July holiday, so we assembled the minions from the world headquarters to sample the newest burger offering in our area. 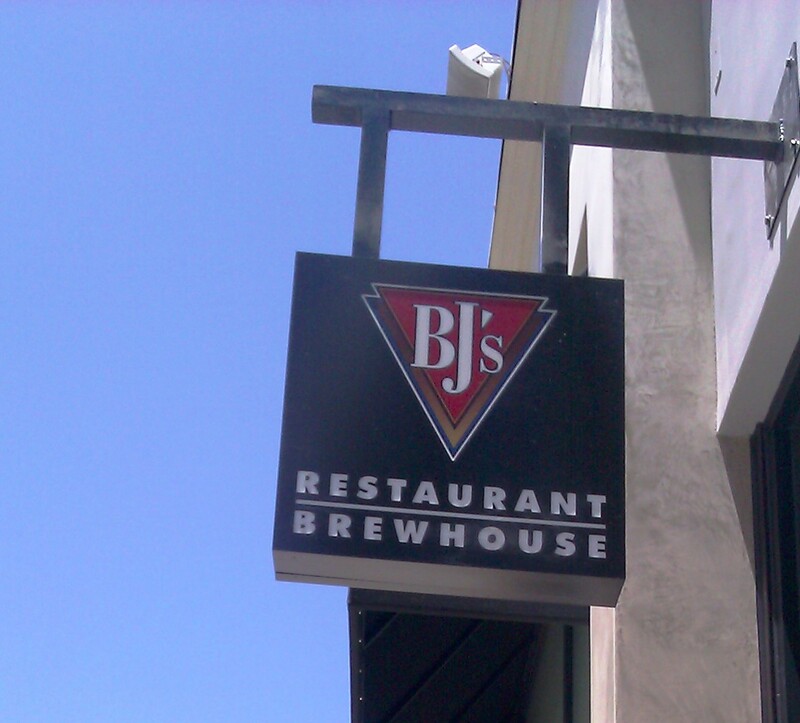 This was the recently-opened BJ's Restaurant and Brewhouse location in Century City. It was a short walk for us, but the mall offered free parking. Even though we arrived at 1:00 PM, BJ's Restaurant and Brewhouse was still packed with the lunch crowd. In spite of that, we managed to get seated promptly. The staff was very hospitable and eager. We ordered a bunch of food, mostly burgers, and settled in for a 30-minute wait for our meals to arrive........the first time. We noted that all of the burgers were aggressively over-cooked and burned around the edges. We sent back the burgers, except for Fat Bruce Lee, and waited an addtional 18 minutes for a re-fire. During that waiting period, I noted that the soft drink glasses were not very clean, and the undersides of all of the plates were flecked with food particles. None of this compared to the comedy of errors that followed, however. The kitchen had a complete meltdown with our meals. The Beef: The menu at BJ's Restaurant and Brewhouse touted 8 ounces of 100% USDA Angus. 100% what? The beef was bland and oily. The loosely-formed burger patty was Chuck. The beef was not aged, and it was about 25% fat. I assumed that the beef arrived pre-ground, since all of the other components of the dish came from outside vendors. I took two bites of the beef before I set it aside. It wasn't bad, but it wasn't good enough to consume. Of the two bites that I took, both were peppered with connective tissue. Beyond that, the patties were closer to 6 ounces than the 8 ounces promised on the menu. The Seasoning: There was no seasoning. 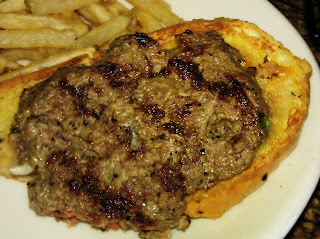 This coupled with the bland beef meant that the burger patty was nearly flavorless. The Sear: The patties were thin, and the sear was nearly non-existent on the second attempt. In spite of the weak sear, the burger patties were flecked with glassy chips of carbon from the grill. It was as if the cook had been cleaning the grates of the gas grill but didn't wipe them down prior to cooking our burgers. The Preparation: On the second attempt, the burgers were all over the place. Mine was closer to Med-Rare, but some others at my table claimed that the temperatures were fine. Fat Bruce Lee powered through his Well-Done burger. Fat Bruce Lee is well on his way to earning the title Garbage Disposal. Beyond that, it was as if there was a tornado in the kitchen at BJ's Restaurant and Brewhouse. My burger arrived without the Cheddar, which I had requested. I ordered the toppings on the side, but there were bits of wet, shredded lettuce on the underside of my burger patty and affixed to the now soggy bottom bun. The shredded lettuce soaked the bottom bun with cold water, which made that an unpalatable mess. The most baffling and amusing blunder was the single french fry that was half-buried in the pile of shredded lettuce on the side plate that accompanied my meal. I could only assume, that the kitchen scraped off the lettuce from my burger and deposited it on that plate. During the transfer, perhaps a fry got caught up in the process. It was either that, or there was an actual tornado in the kitchen. On the cheeseburgers that actually had cheese on them, some had melted cheese, and on others the cheese was still cold. It took the kitchen 48 minutes to deliver disastrously prepared burgers. The Cheese: My burger did not receive any cheese. The Bun: I ordered the BJ's Burger--the "BJ" part of which probably stood for Botched Job. 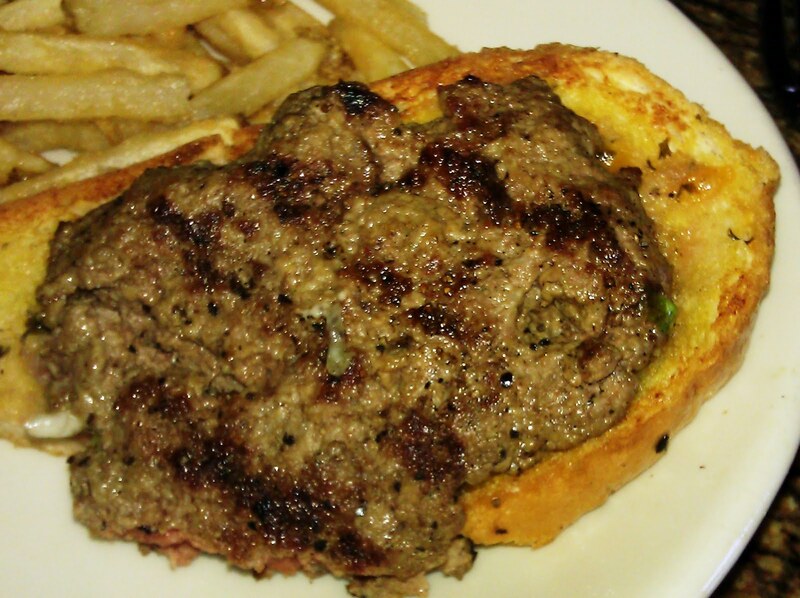 This burger was served on a garlic buttered French roll. The roll was compressed, sodden, and gummy. It offered no crispness, and it was only toasted around the edges. Additionally, the top of the bun was coated in oil, so this bun was a greasy mess. The Fries: The shoestring fries were completely unseasoned and utterly bland. They were adequately crisp and browned, however. The Toppings: The Roma tomato slices were mushy and bland. 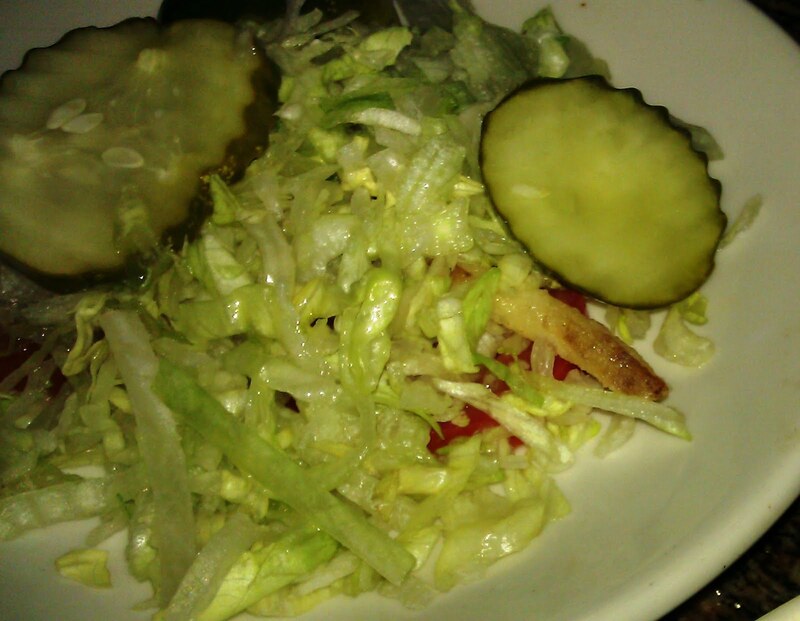 The shredded Iceberg lettuce was wet, bland, and pale. Interestingly, the tomato in the Caprese Salad was rubbery and hard. The Value: The manager comped the food portion of the bill for the entire table, since the non-burger eaters finished their food before the re-fired burgers ever arrived and the burgers were a disaster anyway. 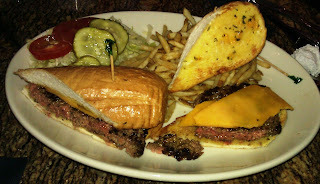 The burgers at BJ's Restaurant and Brewhouse started at about 9 bucks. I will return once I work up the nerve to get a feel for the value on a day when the kitchen is not dead set on turning out unacceptable food. The front-of-house staff at BJ's Restaurant and Brewhouse was fantastic. They were cheerful, enthusiastic, and professional. Sadly, the kitchen was a different story. I only ate two bites of my bland, greasy burger. It wasn't so much the flavor as it was the wet and oily texture, which resulted from a lot of mishandling by the kitchen. Perhaps this location will settle in as they cycle through the initial round of kitchen staff replacements to find cooks that are capable of cooking. At the end of the day, I paid 5 dollars for a soft drink in a dirty glass. Burger Review : A wildly incompetently prepared burger delivered by a careless kitchen and a gracious front-of-house staff. Average food prepared badly. --...and the undersides of all of the plates were flecked with food particles. None of this compared to the comedy of errors that followed, however. The kitchen had a complete meltdown with our meals. --Fat Bruce Lee powered through his well-done burger. --Beyond that, it was as if there was a tornado in the kitchen at BJ's Restaurant and Brewhouse. --It was either that, or there was an actual tornado in the kitchen. --The Roma tomato slices were mushy and bland...Interestingly, the tomato in the Caprese Salad was rubbery and hard. --At the end of the day, I paid 5 dollars for a soft drink in a dirty glass.